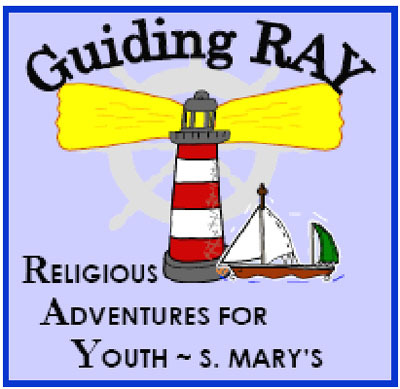 At Saint Mary’s, we are committed to the spiritual formation of our children, and our Guiding RAY program provides fun, interactive and spiritual instruction for Pre K-8th grade. Our classes are designed to both appeal to and offer our children an opportunity to learn key bible stories and to develop their relationship with God. Our program theme in 2018-19 is “God’s Covenants”. We will explore this theme using the Workshop Rotation model of teaching, and are all extremely excited for this program of Christian Formation. With this model children take an in depth look at a bible story for 3-4 weeks. Each week they explore the story in different workshops. The workshops will be activities that might include art, science, games, drama, video, or cooking. We will be using curricula that is Scripturally-based and consistent with Episcopal theological principles and spiritual practices. The program is designed to immerse children in Bible stories where they can experience God, discover and explore their innately spiritual nature, and wonder together about the marvelous things God is doing! Our day will begin at 9:30 in the Guiding RAY gathering room. We welcome adults to join us and have a preview of the lesson we will be learning as well as have a chance to ask questions or just chat. At 10:50, the children will be escorted to the sanctuary for the Eucharist. Special services for children (i.e., Ash Wednesday, Good Friday Children’s Stations of the Cross, and the annual Christmas Pageant) are held throughout the year. Volunteer with us! We are always in need of more leaders and assistant leaders for our many formation programs and the new structure is designed to make it easy to be involved. Want to help, but don’t know how? Would you like to work with a certain age group? Want to work behind the scenes? There are tasks for all, whether you wish to serve once a week, once a month or once a year. FMI: Megan Akers , Christian Formation Director.